On Friday April 15, 2016 the three-member California Agricultural Labor Relations Board voted to set aside the November 5, 2013 decertification election of the United Farm Workers at Gerawan Farming, and destroy the Gerawan employees’ ballots. This decision punishes the Gerawan workers, and demonstrates just how berserk the ALRB is. This unsettling ALRB decision never addresses the Board’s own role in forcing the Gerawan workers into Mandatory Mediation and Conciliation, or the multiple cases against it. The decision never once had the ALRB members holding a mirror up, acknowledging how its own decisions to impose a forced union contract on the employees started this campaign. The ALRB board never acknowledged Judge Hamilton’s Superior Court decision saying it was clear the ALRB and UFW were “in cahoots.” The ALRB three-member Board decision never acknowledged the Court of Appeal decision a year ago, which found that a shotgun marriage officiated by the ALRB between the Gerawan workers and the UFW was wrong. The ALRB decision never accounted for the 22 years the UFW was missing from the Gerawan workplace. And the ALRB never acknowledged that the decertification election took place under the watchful eye of Superior Court Judge Hamilton, which he had backed up with threats of injunctions, orders of contempt, and Temporary Restraining Orders. If that is not enough to give free choice a fighting chance, then what is? Gerawan farm worker Silvia Lopez has worked for Gerawan for 18 years. The original vote to unionize Gerawan Farming, Inc. took place more than 23 years ago. As with most unionized workers today, Lopez never voted for the union. And in her 18 years of employment with Gerawan, neither she nor any other worker has ever received any of the union benefits it claims to want to start providing, because the union was absent the entire time; no collective bargaining agreement was ever initiated or put into place. On the contrary, Lopez and her coworkers say they love their employer, enjoy the highest wages in the industry, and a myriad of other employer-provided benefits. So, Silvia Lopez led the successful petition effort in which the ALRB had to hold an election; and thousands of her co-workers likely voted to decertify the UFW union from Gerawan Farming. But the California Agricultural Labor Relations Board refused to certify the election claiming election improprieties. They locked up the ballots on Nov. 5, 2013. Lopez sent appeals to state lawmakers reminding them of UFW founder Cesar Chavez’s goal of wanting the dignity and rights of farm workers to be respected. Lopez even solicited help from the Legislative Latino Caucus in Sacramento. Not one Latino Caucus member ever returned her calls, and all refused to meet with her. It would appear that “every vote counts” only really matters unless it is a union decertification election. In announcing its intention to destroy the ballots and disenfranchise the workers, the ALRB will deprive the workers of their rights guaranteed by the state Constitution, and state law – the Agricultural Labor Relations Act, created, passed and signed into law by Gov. Jerry Brown in 1975. Only now, Gov. 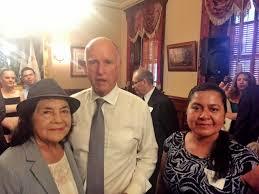 Brown and his well-connected political appointees on the ALRB (all Democrats) don’t like the voice of the farm workers, solely because thousands of farm workers in California do not want to be unionized. This entry was posted on Monday, April 18th, 2016 at 5:37 pm and is filed under Blog Posts.